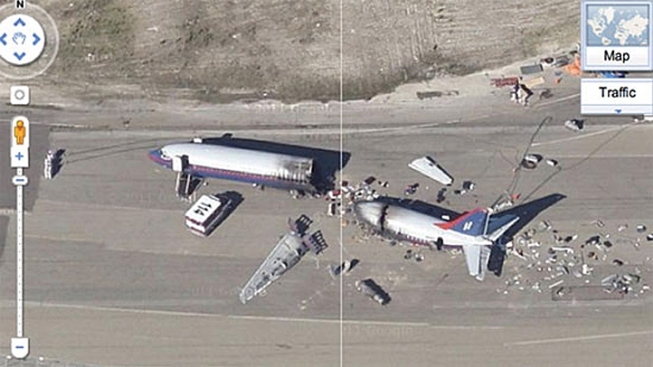 This Google Maps plane crash was actually created for the late NBC show Trauma back in 2009. If you follow this link to Google Maps, you'll see a pretty serious-looking plane crash captured by the satellite images. But don't worry: you're not looking at a real plane crash, and no one was hurt. The crash was actually created for the late NBC show Trauma back in 2009, the last time the satellites snapped pictures of the runway at the former Navy base at Alameda point. So while the show may have been cancelled, its very expensive set piece will live on on Google Maps. At least until the next round of photos are taken.